Congress President Sonia Gandhi faces the media after the party’s woeful showing in state assembly elections. Rahul Gandhi’s faltering performance in recently concluded elections has proven to be a blessing in disguise for Prime Minister Manmohan Singh. Indian National Congress (INC) President Sonia Gandhi seemingly confirmed this when making a rare appearance before the media on March 7. Had her son Rahul performed well and brought the Congress party to a position of power in Uttar Pradesh, it would have been difficult for Singh to continue on as prime minister. Many believe that there would have been a widespread clamor to make Rahul premier, just as leaders of the Samajwadi Party have been demanding a chief ministership for Akhilesh Yadav since the election. After Rahul’s poor showing, though, Sonia has no one else she can turn to. Singh’s position seems secure. Sonia shared her candid assessment of her party’s drubbing in the assembly polls and made two important points. One, there are no plans to replace Singh, and the poll debacle won’t have any impact on the United Progressive Alliance (UPA) government at the center. Second, the Congress fared poorly in Uttar Pradesh because of “too many leaders” and a poor choice of candidates. Sonia did keep mum on the question of who would be the Congress party’s prime ministerial candidate at the next general election, due to be held in May 2014. However, before her impromptu press conference outside her residence, Sonia held a meeting with top party leaders who had performed key roles in the state assembly election campaigns. Rahul, who was the star campaigner for the party in UP, was conspicuous by his absence. 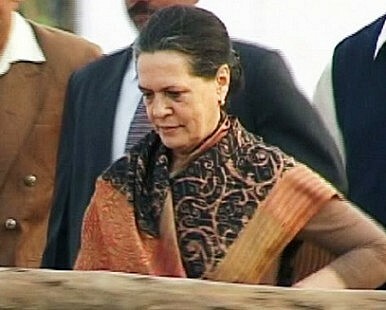 The Congress president gracefully accepted her party’s defeat as the choice of the people. She said she regarded every election, win or loss, as a lesson for the party. She fielded every question with composure, admitting that people simply weren’t happy with sitting legislative assembly members. Sonia singled out the Congress defeat in Punjab as “a big blow,” and said her party was hurt by the Punjab People’s Party (PPP), headed by Akali rebel Manpreet Singh Badal. She said the PPP, which didn’t win any seats on Tuesday, damaged the Congress rather than the victorious Shiromani Akali Dal, as had been expected. In Goa, where the Bharatiya Janata Party wrested power from the Congress, Sonia said the voters were simply unhappy with the Congress performance in the state. What's Big for IndiaCabinet Reshuffle in the Works?Don't Count the UPA Government Out Just YetOpposition MP Calls UPA 'Illegitimate'Rahul Gandhi's New Post?